Ted Ligety, left, speaks with Doug Lewis of NBC during a news conference on Thursday, Nov. 30 in Beaver Creek Village. Ligety spoke about his tweets, fatherhood, new skis and, most importantly his health. BEAVER CREEK — The conspiracy theory that surrounded the cancellation of the season-opening World Cup giant slalom in Soelden, Austria, back in October is mercifully over. 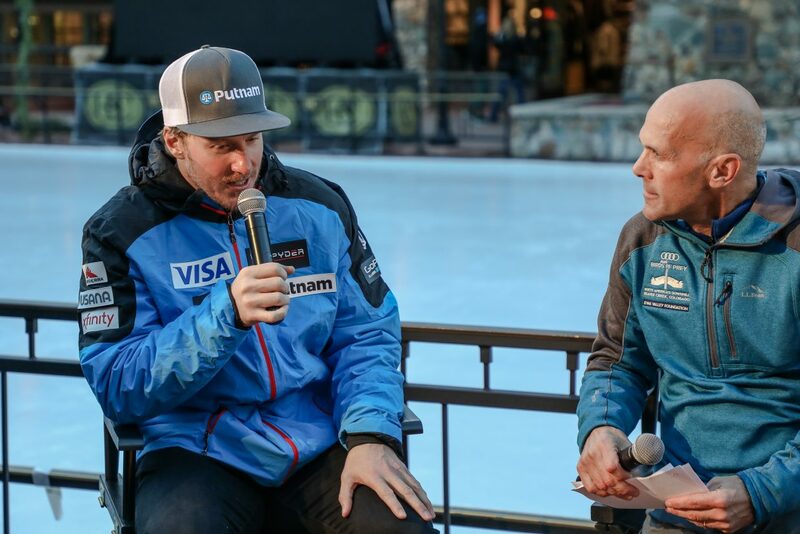 The world can rest easy now as Ligety met the media on Thursday, Nov. 30, in Beaver Creek Village as he gears up for Friday, Dec. 1’s Birds of Prey super-G and Sunday, Dec. 3’s giant slalom. A lot has changed for the Park City, Utah, native in the two years since Birds of Prey was held last. Ligety’s a father — his son, Jax, missed the news conference as he was napping. The International Ski Federation FIS has changed the rules again on GS skis. And Ligety is coming off knee (2015-16 season) and back (206-17) injuries. And, oh yeah, he’s defending his Olympic gold in GS in February. The U.S. Ski Team is getting younger these days. Jax Ligety is one of four newborns traveling with the squad. “It’s the U.S. Daycare Team,” Dad joked. No laughing matter is Ligety’s health. And his health gets its first test this weekend. Ligety, 33, is the face of the U.S. Men’s Skiing Team with 25 career World Cup wins — 24 in giant slalom — five FIS Alpine World Ski Championships gold medals and two Olympic golds. Six of those World Cup wins have come here at Beaver Creek. The last of his Worlds gold medals was at the Championships in 2015 on Birds of Prey via a dramatic duel with Hirscher. Yet, his last win came in Soelden in 2015. Before he did his knee, he was a shocking DNF during the 2015 Birds of Prey GS. That said, Hirscher’s also coming off an injury, so maybe their rivalry is back to square one? Since Sunday is the first GS race of the season, it’s also the first time for the new FIS giant-slalom rules to go into competition. The ski radius has been changed from 35 to 30 meters and the new length of the skis is 193 centimeters. In English, they’re shorter and have more curve, the latter being an important in the ability to turn. Remembering previous episodes of “Ted Ligety’s Rants against FIS,” he was fuming about the move to a radius of 35 meters as the 2012-13 season approached. So, he’s happy with the new regulations. As for the Olympics, Ligety says the best way to prepare is competing on the World Cup on a weekly basis, like facing the pressure to win on home snow this weekend. And, let’s face it, the guy has a good record in South Korea. “The last time I skied there was 12 years ago and that was my first World Cup win,” he said.